RT’s Murad Gazdiev follows the terrifying journey thousands of Iraqi families have undertaken to escape the warzone in Mosul. Caught between heavy coalition airstrikes and terrorist shellings and sniper fire, civilians take advantage of the chaos to flee. An RT crew got a firsthand look at the hurdles civilians trapped between the fighting sides in western Mosul must overcome to reach the safety they’ve been longing for since the offensive began. “They have to walk literally through the crossfire between the Iraqi army and ISIS [IS, Islamic State, formerly ISIL]… The airstrike hits, the civilians use the confusion to get out and the Iraqi army moves in,” Murad Gazdiev noted. Desperate civilians are undertaking the perilous journey en mass, despite the unavoidable risk of being caught in the crossfire. If they are fortunate enough to safely traverse the leveled neighborhoods under the threat of shellings and imminent death, they find that their hardships are not over, as they have to deal with the harsh reality of overcrowded refugee camps. The civilians who escape western Mosul are first sent to a refugee camp in the town of Hamam al-Alil south of Mosul, which was liberated by Iraqi forces in November. Once there, they have to wait for buses to take them to other refugee camps, where they will live until the city is cleared of jihadists. The number of newcomers arriving daily is staggering. IS fighters also use airstrikes and chaos to their advantage. The plumes of smoke rising from stricken buildings serve as good cover for jihadists, as “you can’t hit what you can’t see,” Gazdiev noted. 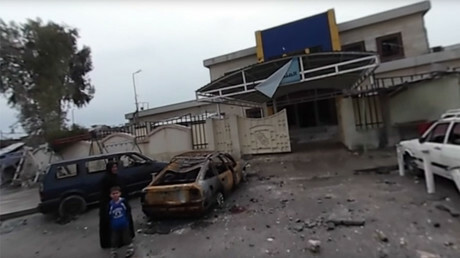 In order to screen themselves from the approaching Iraqi army, they set cars and other objects alight. “They are burning cars,” said a teenage boy who escaped a part of Mosul controlled by IS as RT was filming. “They even burned the fire trucks,” his friend added. Speaking to RT, refugees described what their life was like under Islamic State and how the US-led coalition’s bombing campaign supporting the Iraqi Army’s offensive to retake Mosul has had a grim impact on their lives. “It was hell for us, and when the Iraqi army came we celebrated. Our district was completely destroyed. Suicide bombers, rockets, jets bombed us all the time. 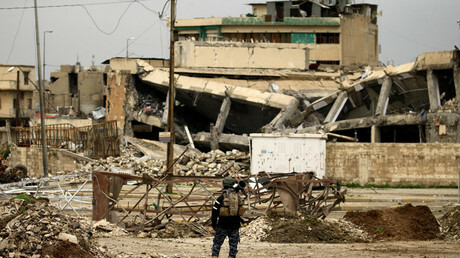 Civilians are still buried under wreckage,” an elderly woman said. “Very often the jets would miss. Seven entire families near us were killed this way. Perhaps their weapons were faulty, as they regularly went off-target,” a young female refugee in burka said. The jihadists would often provoke such “mistakes,” drawing fire upon themselves while in residential buildings and then leaving them just before the jets hit. “IS did it on purpose. They would break in and start shooting from the roof. The army could see them and in a half an hour there would be an airstrike,” a woman said. While the constant airstrikes being carried out by coalition jets has compounded the already desperate plight of civilians, life under Islamic State was getting unbearable. “What little food there was, ISIS shared among themselves. They said we were unbelievers, and didn’t deserve anything,” the young woman said. Iraqi forces have managed to completely liberate the eastern part of Mosul since they launched their offensive in October. They are now struggling to flush the jihadists out of the city’s western districts, where the militants are making a stand. 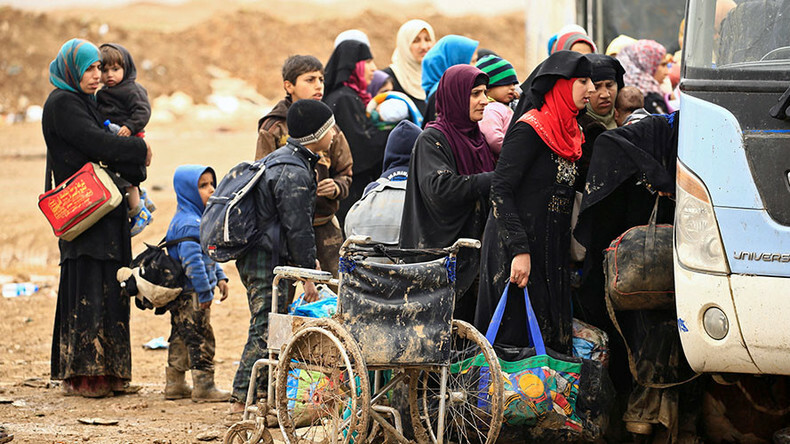 The UN refugee agency UNHCR fears that a fresh wave of displaced people fleeing western Mosul, which it estimates could comprise 300,000 people, will overwhelm its capacity to accommodate them. From October of last year to early March, UNHCR estimated that about 192,000 residents had fled Mosul, while around 750,000 still remained. Since the siege intensified in February, an average of 5,000 people have been fleeing the city every day, other UN figures suggest.